Bring timeless style and classic design elements into your garden with the Rome Black Armillary Sphere with Hairpin Base. In past centuries, armillaries were used as models of the solar system, and this adornment will surely add a heavenly bit of style to your setting. Its open orb and legs offer a modern theme, while the black color remains timeless and elegant. The 24" tall, wrought iron stand creates a durable support, and its three legs each have a "V" shape to showcase the hairpin theme. The slightly rounded bottom of each leg ensures the stand is stable when placed in soil or on your patio, and the included sphere easily attaches to the top, 3" diameter, metal disc. Five overlapping bands create this striking orb, and a 19" long arrow through its center adds a classic armillary detail to it. The wrought iron construction ensures this accent remains hardy when placed outdoors, while its black finish captures attention. 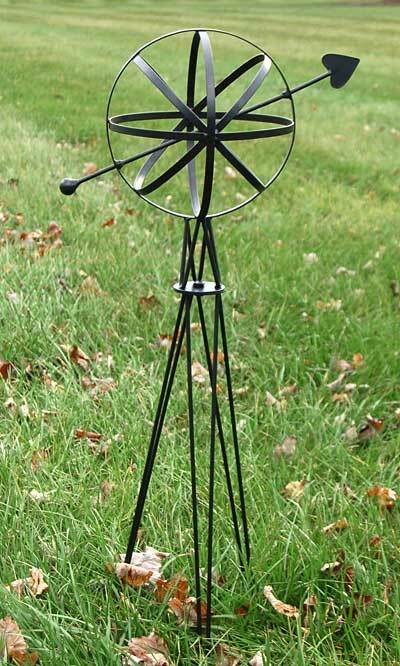 Brilliantly mesh classic and modern themes in your landscaping with this Black Armillary Sphere with Hairpin Base. Some assembly required.